Clifden – The St. Patrick’s Day Parade Committee of the Clifden & District Community Council, with sponsorship from the Connemara Chamber of Commerce and Clifden Town Lotto, wish to invite you this year’s St. Patrick’s Parade. The parade will commence at 12.30. Stewards will be on hand along route to aid and assist in any way to ensure a safe and well marshaled parade. 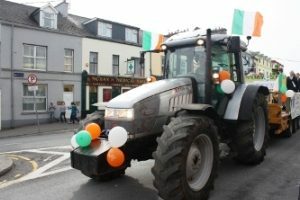 Oughterard – The Oughterard Festivals Committee are looking for more entries for the Oughterard St.Patrick’s Day Parade which takes place on 17th March from 1.00pm – 3.30pm. Entry forms are available from the Tourist Office. So help us make this years parade the best Oughterard has experienced yet! Roundstone – A Saint Patricks Day Parade in takes place in Roundstone. Lots of Fun and games for all the Family. Parade at 2.00pm. All proceeds will be donated to Cancer Care West. All support is greatly appreciated.